We are pleased to provide this valuable resource to filmmakers, production support service companies, and our talented local DC individuals who comprise this areas film & media workforce. Below you can find crew and vendors for your upcoming production; or list your self or your business 24-hours a day, 7-days a week. Choose the category that fits you and get started!!! Do you have a job or casting opportunity you want people to know about? Please let us know and we would be happy to share it with our community. 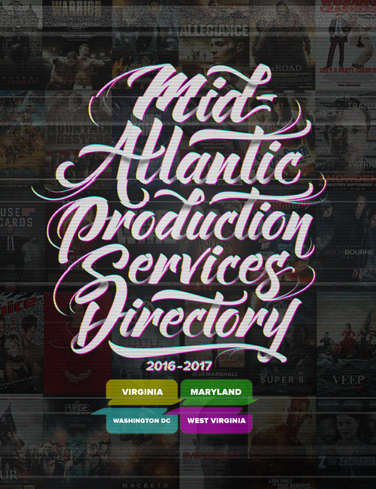 We have also once again up with the Virginia Film Office and Oz Publishing's Maryland Film and Video Dire ctory again to produce the 2016 - 2017 Mid-Atlantic Production Services Directory. This directory extends our reach to the mid-atlantic region enabling DC residents to cast a wider net as they look to hire crew and production services for DC-based productions, or for job opportunities that may be in reach just a few miles outside of the District. The Mid-Atlantic Directory includes listings of pre-production resources, production staff and technical crew, producers and production companies, equipment and stages, post-production facilities, and support services. Basic listings are available to freelancers, free of charge. Oz Publishing is currently accepting listings for DC residents for their 2017-2018 online directory.